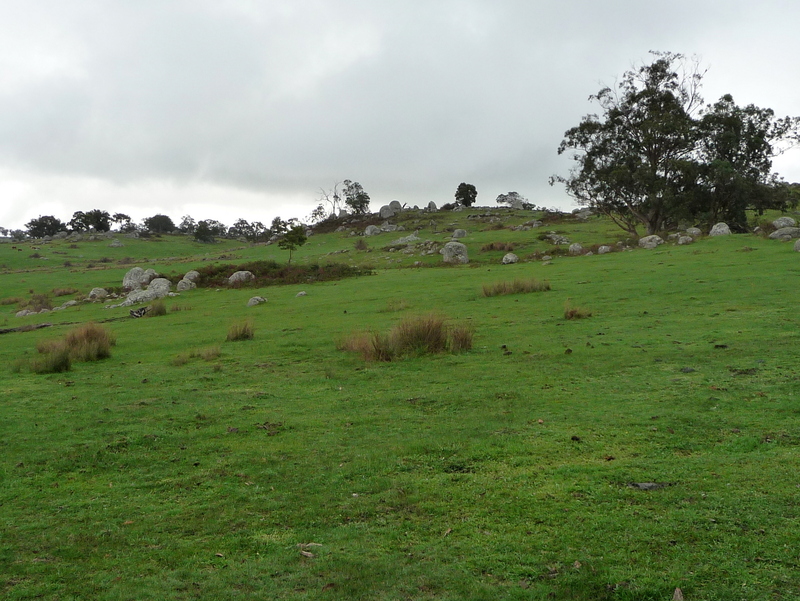 Changing landscapes and land use in the Strathbogie hills. The greatest grassland blog on the planet, Chris Helzer’s Prairie Ecologist, has a fantastic structure. The posts alternate between insightful discussions of prairie ecology and delightful images of prairie splendor, in Chris’s Photo of the Week series. In simple mimicry, this is the first in a series of photo blogs which will alternate with my regular essays. Since I can’t take a high-speed, telephoto closeup half as good as Chris can (see this for example), I’ll over-compensate in the opposite direction: to show big, slow time-lapse photos of vegetation change. Every month I’ll post pairs of air photos from Victoria, Australia. 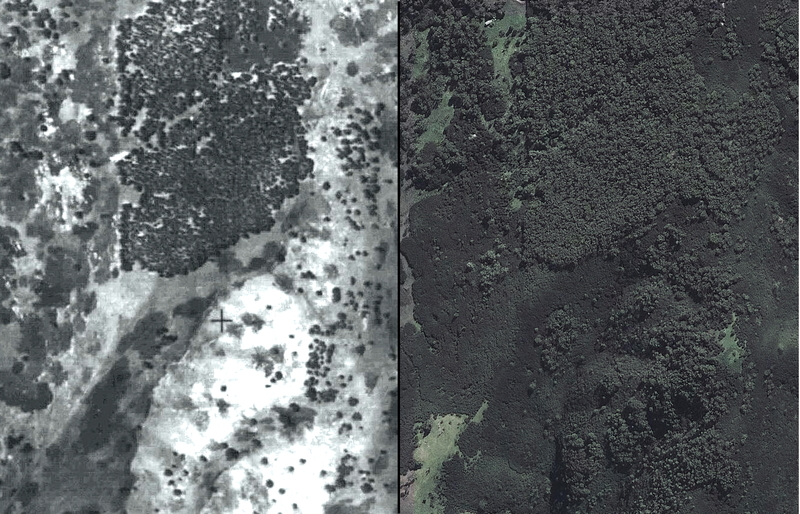 The first photo in each pair, from the 1940s, is among the earliest air photos taken in Australia, and the second is the most recent image, courtesy of Google Earth.In Australia, the big story from old air photos is ongoing loss, thanks to clearing. There’s nothing uplifting about watching ecosystems being destroyed. So I’ll post photos of areas where shrublands and forests have regenerated naturally, to reverse the losses caused by earlier clearing. Where possible, I’ll describe what we know about the nature and causes of the changes. The blogs will include a variety of changes, from regeneration in abandoned paddocks to infilling (or ‘densification’) in remnant forests and woodlands. Whether the changes bode well or badly for biodiversity or other values, I’ll leave an open question. My main aim is to highlight the many instances of passive regeneration that exist across the state, and to encourage others to visit and learn more about them. Australian ecologists have done lots of great research in intact ecosystems and, more recently, in planted and restored areas, but we know very little about ecological processes and biodiversity in areas that have regenerated naturally. The first Growback post is from the southern fall of the Strathbogie Ranges, just north of the Goulburn River, between Seymour and Yea in central Victoria. The photo below, from Google Earth, shows part of the area as it appeared in 2010. Most of the native vegetation (shown in dark green) has regenerated naturally since the 1940s. 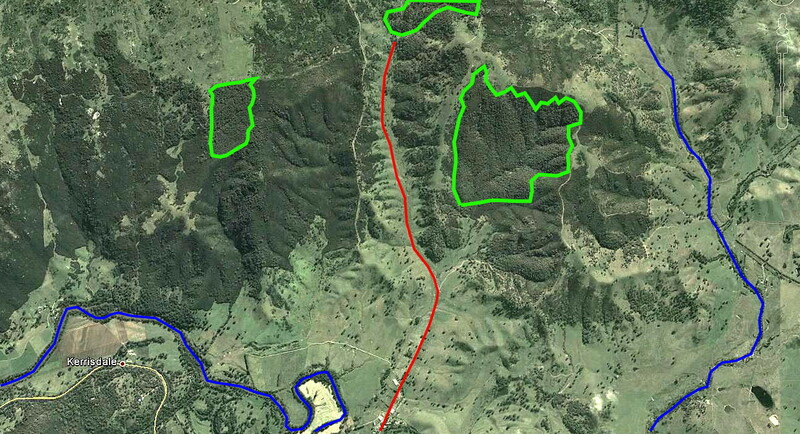 For cross-reference, the blue lines show rivers and creeks and the red line shows a road. Native vegetation on the southern slopes of the Strathbogie Ranges in 2010. Image from Google Earth. The area was a lot barer in the 1940s. The photo below is from a photo-mosaic that was flown in 1947. The early images contain a lot of detail but at this scale the most obvious pattern is the patchwork of stitched-together photos. The green polygons show the largest patches of dense vegetation that existed in the 1940s; the approximate boundaries of the same patches are shown above. 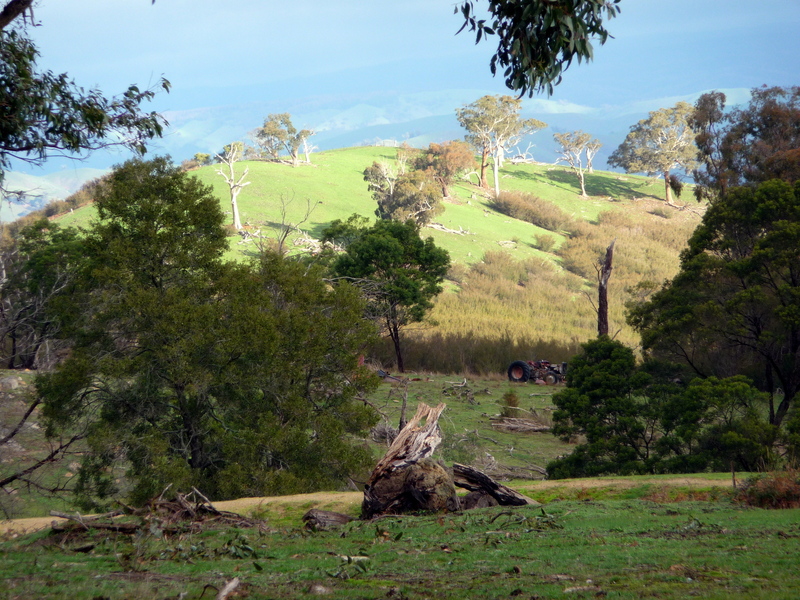 Back then most of the landscape supported scattered trees in heavily grazed paddocks. This photo does look a lot better if you blow it up (click on it). The same area in 1947. The green lines show the biggest patches of dense vegetation that existed 65 years ago. Click on the image to see a larger view. Closeup views are more informative. The left-hand patch outlined in green on the photo above is shown below. The area around the patch was cleared and heavily grazed in 1947. I suspect that the grey, birthmark-like ‘blobs’ in the cleared areas are patches of dense grass (or perhaps bracken), as they have a fine, uniform texture. The black dots are trees. By contrast, the dark areas in the right-hand photo are trees (the ‘cauliflower-like’ texture) and shrubs (the fine-textured dark areas). The same patch in 1947 and 2010. Trees and shrubs have expanded greatly over 60 years. A better view can be seen below. Scattered trees (with their dark shadows falling to the right) grew on bare, denuded slopes. In this image, the grey ‘blobs’ over the ground are definitely ground-cover plants, not shrubs or trees, as tree shadows can be seen to fall across the uniform-textured ‘blobs’. It’s possible to match individual trees between the two photos, as the blue circles show. Another close-up view from 1947 and 2010. 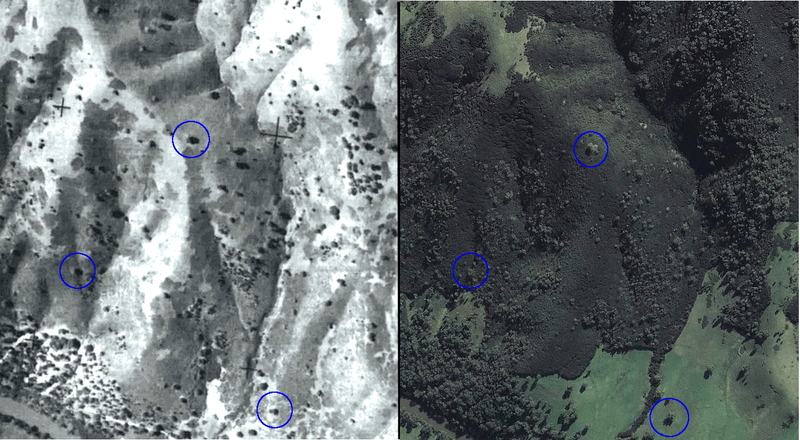 Individual trees can be matched between the two photos, as shown in the blue circles. So what does the regeneration look like nowadays? I visited the region a few years ago. The granite hills are clothed with a dense shrubland dominated by Burgan (Kunzea ericoides) with patches of young eucalypts and a variety of wattles (including Acacia mearnsii, A. melanoxylon and A. implexa). 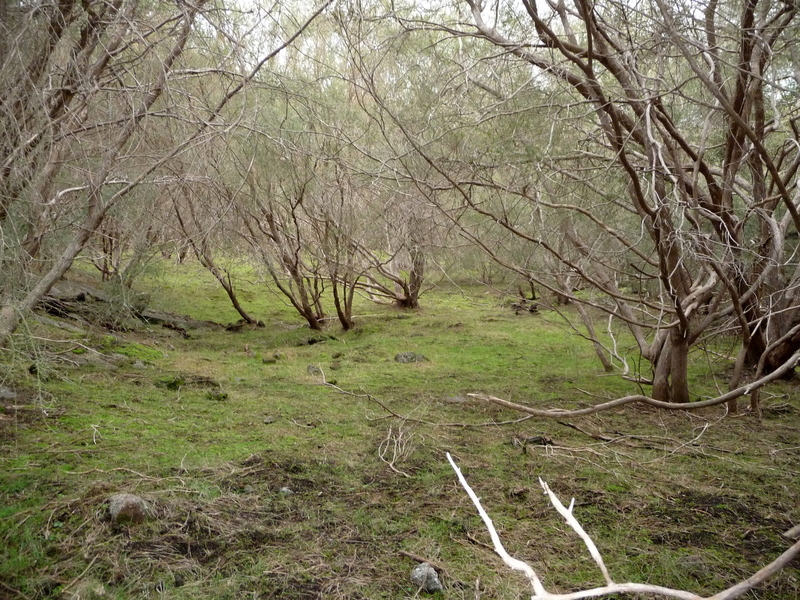 Burgan forms dense thickets over 3 m tall, as can be seen in the photos below. The shrubby regrowth must be a great habitat for Swamp Wallabies and Wombats, as the ground vegetation is uniformly, closely grazed. 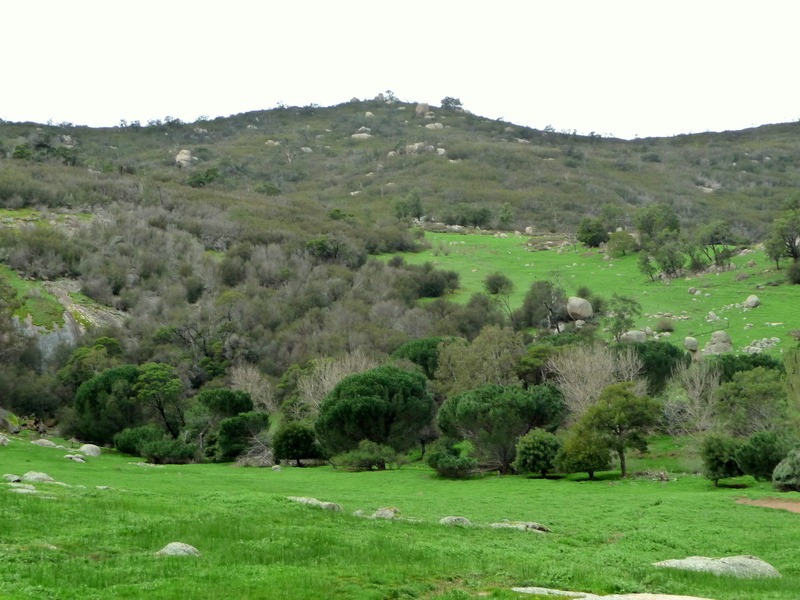 Granite boulders protrude above the new burgan shrubland. Tall Burgan (Kunzea ericoides) grows above a closely-grazed grass layer. It’s possible to gain a glimpse of what the landscape looked like 65 years ago, from the open paddocks that are still grazed by livestock. The paddocks probably carry a lot more grass now than they did in 1947, but the vista is much the same. An open, shrub-free paddock that is still being by livestock. Most of the region must have looked like this in the 1940s. Like many areas in central Victoria, the hills in the Yea region have experienced big changes in land use over the past 60 years. Many areas now support hobby farms and weekend retreats (or ‘amenity land use’ as the social scientists call it). As land use continues to change, so will the vegetation. Who knows what the region will look like 60 years from now? Hopefully by then we’ll have a much better understanding of the ecological and social values that these large areas of natural regeneration provide. It would be great to hear from readers who know this area well. When did the regeneration start? What prompted it to occur? What birds and animals live in the new forests and shrublands now? Please leave a comment. Next Growback 2: A shrinking wetland? That is just sensational, Just shows that we can live in harmony rather than just cut everything down! Mind you I must admit even in Melbourne I am starting to hear Kookaburras in parks like Como park in South Yarra and even “Grand Prix” Central Albert Park!